There’s a lot of radical thinking going on in the mobile business these days and here’s the latest. 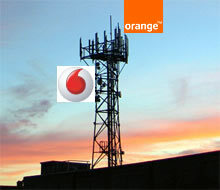 Vodafone and Orange have signed a non-binding agreement to let each other to use the others 3G infrastructure. It’s all about their RANs – Radio Access Networks, which connect customers mobiles to the operators networks. Until now they’ve gone around installing their own, but are now realising that this is a mighty expensive business, seeing as the cost is several £100k per base station. In rural areas these may only service a handful of people, thus rending their investment uneconomic. The summary – share infrastructure, but compete on service. When the mobile companies bid for the 3G licenses, not only did they pay over a huge amount of money, but they also took on obligations to provider 3G services to a certain percentage of the UK population. As not many people have signed up for 3G, the mobile companies haven’t wanted to spend the money on servicing a population that isn’t giving them money with subscriptions and they’ve let their obligations slip. Until now Ofcom hasn’t been pursing them on this. Three, the largest 3G provider in the UK, has recently been saddled with three little letters by Ofcom – SMP – Significant Market Power. They’re not too happy with the restrictions that this imposes on them, so have been pointing out to Ofcom that the other 3G license holders aren’t fulfilling their coverage obligations. To ensure that they don’t get saddled with substantial fines by Ofcom, the other 3G holders will need to expand their infrastructure. By sharing costs on this, they save money. More details of this will be provided by Steve Kennedy, an expert in this area, in an article later today tomorrow.